Kristen Koch (right) goes up for a spike for the GRU volleyball team. AUGUSTA, Ga. – GRU Augusta volleyball senior Kristen Koch (Niceland, Fla.) is one of seven in the entire Peach Belt Conference to be named to the 2014 preseason All-Conference team, the Peach Belt office announced Friday afternoon. Koch headlines the returning Jaguar offense as the team gets ready for their 2014 season which starts on Sept. 5-6 at the Queens Invitational in Charlotte, N.C. Last season in 2013, Koch ranked first in the league with 406 kills (3.50 per set) and started 32 of her 33 matches. 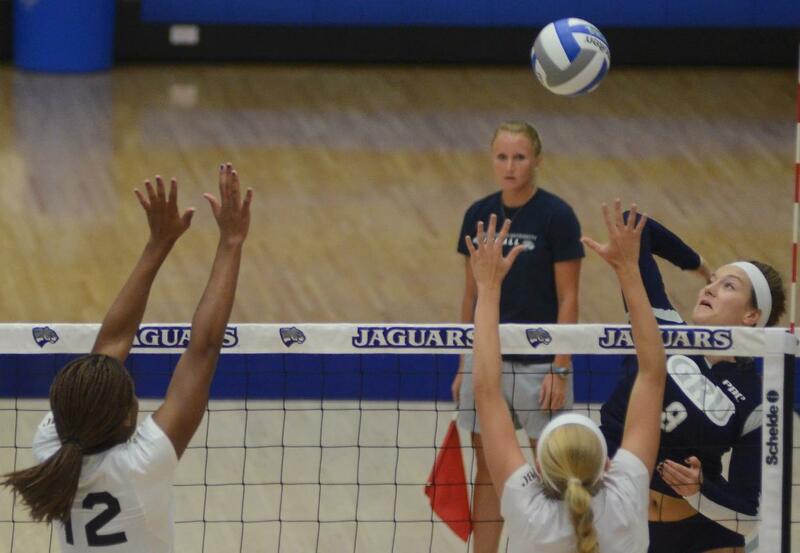 She ranked third for the Jaguars in assists (24), and fifth in blocks (30.0) and posted 25 double-figure kill games. As a sophomore in 2012, Koch ranked second for GRU in kills and was third in kills as a freshman in 2011, starting 33 or more matches both years. Aside from competition, Koch is currently in her second and final term as the SAAC (Student-Athlete Advisory Committee) president for GRU Augusta Athletics and plans on graduating with a degree in biology.